Elite Sportsplex Waterford review, pics, and info. 73,000 sq ft indoor facility features volleyball courts, basketball courts, cheer, lacrosse, gymnastics, futsol, dodgeball, and more. 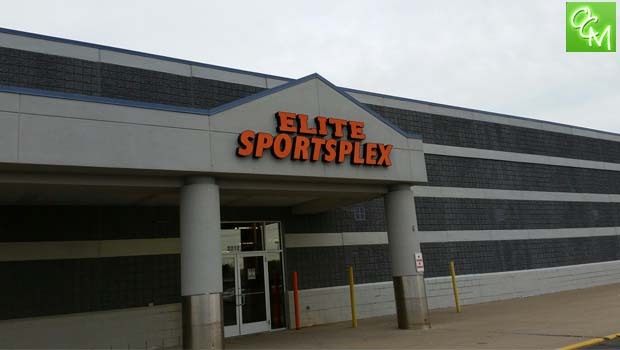 You can rent Elite Sportsplex sports courts to host parties, or just drop by for open gym. Elite hosts leagues, practices, and tournaments for all youth and adult sports. If you need a large space to rent for trade shows, conventions, community events, or shows… look no further than Elite Sportsplex. Elite Sportsplex also has a concession stand, free WiFi, and plenty of dedicated parking. The entire indoor facility and all the sports courts are properly netted off to prevent the action from spilling over from one league to another. The floor surfaces are custom designed for each sport. Volleyball courts have a nice bounce to the floor and the basketball courts have a softened surface as well. Pickleball floor surfaces are bare wood that can provide plenty of bounce. Nets and goals for all sports are all padded and of high-quality. Elite keeps the entire facility air conditioned on warm days so weather (or temperature) is never an issue. Elite Sportsplex hosts their own summer camps (Sports ‘N More Day Camp) and they also have a party area for birthday parties. Elite Sportsplex has 3 different birthday party packages – just pick your sport.